In today’s darts world, electronic dartboards have replaced the traditional bristle dartboards. Playing darts is quite common during parties or family get-togethers. Electronic dartboards allow both the amateur and professional players to have a great pastime. It had made the whole game more exciting and less quarrelsome. Listed below are some of the best electronic dartboards. 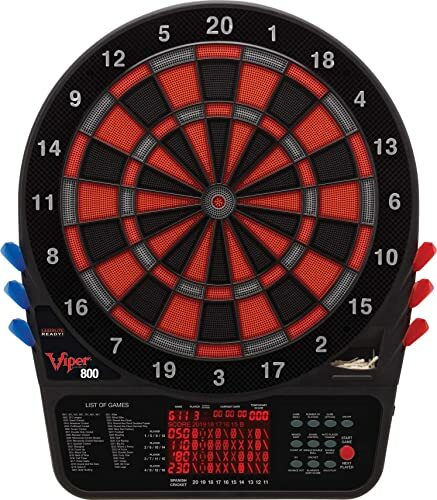 Viper 777 is one of the best electronic dart boards available on the market. This electronic dartboard is intelligently designed with a target face of a regulation size 15.5”, apart from that it comes with a beautiful bright LCD display that never fails to deliver a clear and crisp view. You can clearly see the scores and statistics in the LCD without any issue. You don’t have to worry about the safety of your wall because there is a dart catch ring that is surrounding the target face; it helps in securing the wall from the missed throws. The amazing Viper 777 is made from a high-quality material known as thermal resin segments; it helps in making the playing surface extremely durable. It guarantees an outstanding experience with elegant colored showcases, black, blue, red and white. The bounce-outs are reduced with the help of a super thin spider, which allows the player to give the best possible performance. Make sure you are using this dartboard with soft tip darts; apart from that Viper 777 has forty-three games with a total of three hundred and twenty options. The one thing that’s really annoying about this dartboard is that it’s really hard to get the darts out from the surface, it wastes a lot of time and meanwhile, all the excitement is gone. It comes with an LCD screen which does not show as clear and crisp view as an LED screen does. If you are a cricket player and looking for an apt electronic dartboard then this one ought to be the right choice. Each and everything used in Arachnid cricket pro electronic dartboard is made from high-quality material, apart from that the target area comes in the official sizes. Arachnid takes pride in offering premium dart boards. You won’t be disappointed by the display as it shows the statistics very clearly. The focus of the scoring board is mainly on cricket, side by side you’ll always get know who is giving a good performance and who is not. A total of eight players can play at the moment, besides that the board offers thirty-nine games with one hundred and seventy-nine different options together with seven special cricket games. The durability and playability of the dartboard are increased due to the high-quality material, Nylon tough segments, and micro-segments. Everything is good about this dartboard except a few; as compared to its competitors it contains fewer games. Other than that both dartboard cabinet and handicapping feature are missing. 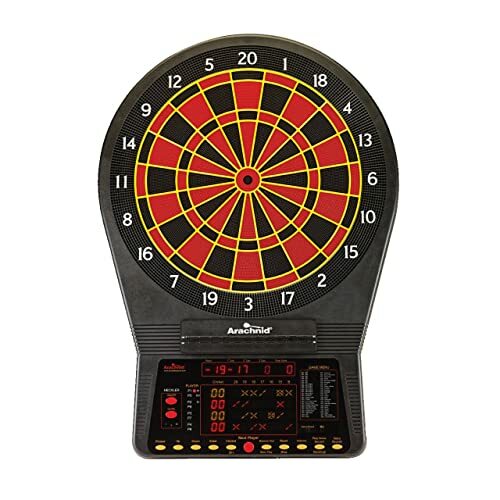 This is one of the most affordable and elegant looking electronic dartboards. It comes with a thirteen-inch area for playing, furthermore, the target area comes is classic colors, black, red and yellow. Arachnid is the only brand that offers classic looking dartboards. The micro-thin segment dividers play an important role in minimizing the bounce-outs and helps in maintain accuracy with the help of active sensors. Moreover, the three-level heckler feature is an amazing feature, it works by applauding the players for good throws and niggle the players for unimpressive scores. However it is optional, it’s up to you if you want to keep it on or off, other than that it comes with three levels the first being mild and the last being unforgiving. You can also track and evaluate your performance with the help of an average point per dart, at the end of each round you can check your score. Overall it’s a good decent electronic dartboard but its volume is very loud even when it’s low. Apart from that, the heckler option is also quite annoying as you have to turn it off every time you change the game or start it from scratch. The Viper 800 Electronic Dartboard offers a combination of quality and durability. The traditional appearance of it is exceptional plus it is full of amazing features. The regulation size of this board is 15.5” which is surrounded by a catch zone that carries the missed throws. The dartboard is made from the finest quality material that makes it extremely reliable. All the bounce-outs are reduced because of the presence of ultra-thin spider. Besides that, it comes with a power supply adapter, mounting hardware, and soft tip darts. You don’t have to use the batteries because it has its own external power supply adapter. There are total fifty-seven games in it with almost three hundred and seven options, moreover, up to sixteen players can play. The showcases are available in stylish colors such as silver, black and red. Although there is applause sound effect present in it the heckler feature is missing, making it a little less interesting. Likewise, the handicap feature is also not there however it is available in most of its competitors. Fat Cat 727 electronic dartboard is available at a very reasonable price on the market. 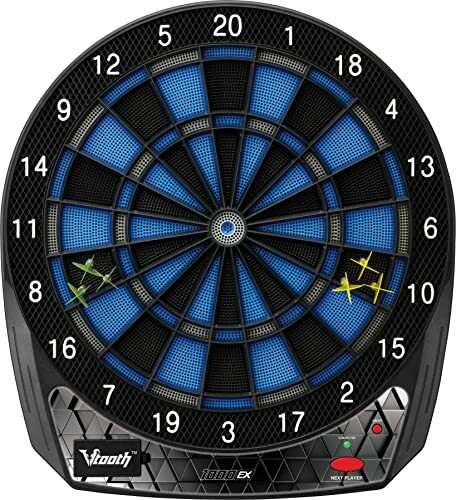 You just have to spend few bucks to get this smartly designed dartboard with eighteen games, apart from that it comes with ninety-six different options to select from. Furthermore, the package includes a total of six soft tip darts, the target area of this dartboard is not that big, it’s just 13”. At such an affordable price it’s a pretty good dartboard with constructive yet simple features. Other than that you’ll need 3 AA batteries for it, however, the batteries are not included in the package. As compared to other electronic dartboards this one has a smaller target area that’s not a standard size. Another problem is that it doesn’t have a large display screen; the little display only shows the scores of one player at a time. Made from high-quality material Fat Cat Electronx is one of the most love electronic dartboards. This electronic dartboard by Fat Cat has nothing to do with the dartboard mentioned above. This one is more advanced and is made from the high-quality material; in addition to that, it has a larger screen display that shows clear and clean results. You can see scores of fours player at the same time, other than that you can also view the cricket scores. It gives you the ability to score better, if you are planning to hold a tournament at your place then this is the best option. Besides that it has thirty-eight games with one hundred and sixty-seven various options for each game, it allows eights players to enjoy the game simultaneously. Unlike regular electronic dartboards, its cabinet is also made from premium material and is beautifully designed to increase the beauty of your room. 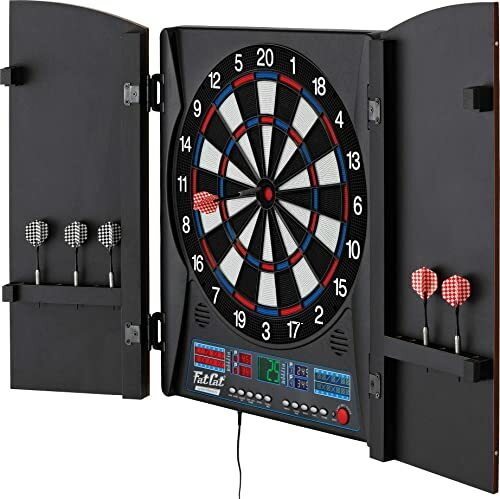 On the whole, it’s a good dartboard but the tips of the dart sticks are short and stubby, most of the darts thrown do not stick to the board, much of the time is wasted collecting the darts from the floor. Apart from that, the sound goes out really quickly. The Bullshooter by Arachnid is one of the top rated electronic dartboards available on the market. Arachnid is one of the best manufacturers of dartboards; they always come up with quality products. This electronic dartboard is nicely designed and comes with a gorgeous cabinet with an elegant dartboard inside. 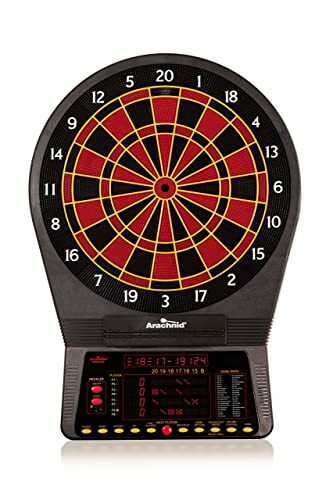 Bullshooter electronic dartboard has a high-quality display screen that shows scores of four players at the same time. Adding on, it comes with thirty-eight different games with one hundred and thirty-seven options to select from. This model of Arachnid also has the amazing feature like its other models, known as Heckler. When the heckler mode is on, you get applauded for the good performance however if your score poorly you’ll get harassed by it. This dartboard is ideal for the get-together or a party with friends. The cabinet and doors are made from high-quality wood, plus it adds beauty to your room. Overall its performance is good but the heckler feature is not as reliable as most of the time its comments do not match the performance of the player. Apart from that, it comes with an LCD display, however, LED display is much better and gives a clearer view. 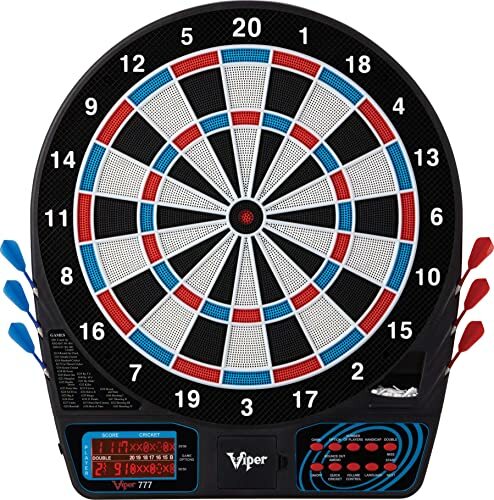 Viper Vtooth 1000 is one of the most popular electronic dartboards available on the market. It is the latest addition to the amazing Viper Vtooth line; however, it is far more advanced than the previous models. For the first time, you are going to play the darts in a different and a unique way, it allows the player to connect the dartboard with the Smartphone, laptop or any other device via the app known as Viper Darts Linkup. This amazing app will let the player keep the record of the scores under a customized profile; the best part is that this app is completely free. Both cricket and ’01 will be available on the same scoreboard, it is super exciting. At present this free App has sixteen games but don’t worry many more are on the way. With the help of the scoreboard app, you can play your favorite game anytime. Other than that it comes with a 13” target face and a stylish color scheme including silver on black and a sharp blue, making the board look stunning. In general, it’s a nice dartboard but the problem is it works when it wants to work; there are times when it won’t start. Apart from that, it’s not that reliable, sometime darts won’t stick to the board. Overall it’s good, Viper has introduced something new but they should also look into these little issues which create bigger problems while playing. 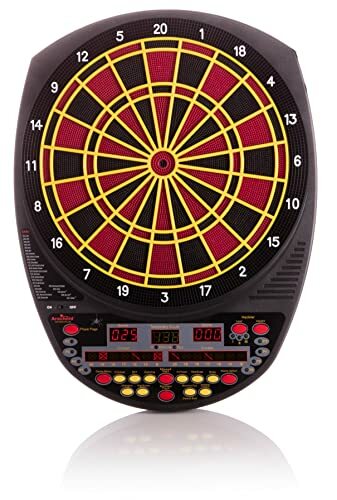 This electronic dartboard comes in regulation size with a 15.5” target face. High-quality nylon segments are used to make it that provides an extremely durable surface and much more peaceful gameplay. To minimize bounce-outs it has an ultra-thin spider, moreover, it helps to maximize the scoring. Unlike other electronic dartboards, this one has a strong built-in storage that is capable of holding two sets of darts. The best thing about it is that this dartboard features fifty-six games with two hundred and sixty-six options and apart from that it can easily accommodate sixteen players. There is also a large sized catch ring that will protect your wall by catching the missed throws. A clear and crisp view is delivered by the bright LCD display; additionally, it comes with stylish colored showcases, black, silver and red. It is a good dartboard but it has some deficits, the wiring from the board is not reliable, it shorts out really quickly. Other than that the sound system is also poorly designed, the low and medium levels don’t work really well. Arachnid is known for producing excellent dartboards, Cricket Pro 900 is also one of its amazing creations. This dartboard has outstanding durability and playability, the occurrence of bounce-outs is minimized by the presence of micro-thin segment dividers. It comes with forty-eight games, apart from that Cricket Pro 900 accommodates eight players. You can track your game scores with the help of the dart averaging feature, besides that it has an advanced voice feature. The dart score is announced by the art voice prompt and there is also a voice record feature which you can use for your own use. The board is designed with vibrant colors and come with a number of accessories. In all, it’s a great dartboard, however, in the beginning, you might find difficult to understand a few features. To minimize the complications it is best to keep the manual by your side. 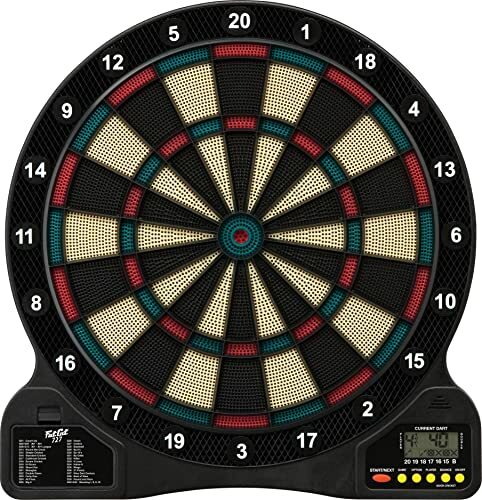 What Makes the Best Electronic Dart Board? You have already read the electronic dartboard reviews mentioned above, those are the most popular ones available on the market. Before buying an electronic dartboard there are certain features you should never compromise on. Here is everything you need to know before getting your hands on a good electric dart board. When you are choosing a board, remember, size is the most important factor. Having a standard size dartboard helps you have more fun and assist you in preparing for tournaments. Although there a number of sizes available on the market but 15.5’’ target surfaced are the most common. If you are a beginner then go for a larger dart board as smaller ones are complicated and are used by professionals. Some dart boards accommodate six players whereas others can easily accommodate up to sixteen players. This all depends on the model and the price of the device. If you are planning to play with a group of friends then go for a dartboard that will fulfill your needs. Make sure you settle for a board that has room for more players. Electronic dartboards come with a wide range of games, try to go for the electronic board that contains a maximum number of games. The readability of the display is something you should always consider, besides that the size of the display is also important. Go for an LCD or LED display for better results. One of the most common things about electronic dartboards is that all of them offer a huge range of games. Make sure you go for the one with the maximum number of games with better and versatile options. Having a dartboard with useful features is extremely important. How to set up an electronic dartboard? This question is often asked frequently, the answer is quite simple. If you are using the electronic dartboard for fun, simply hang it on the wall however if you are a professional and are planning to have a tournament then you must follow specialized measurements. How to protect the wall? Most of the electronic dart boards come with a dart catch ring that prevents the wall from any damage. In case the one you are buying is not having this feature then ensure you buy a wall protector yourself. What is the ideal size of a dartboard? How much does a dartboard cost? There are a number of models available on the market so the price varies accordingly. Some simple electronic boards are available for only $15, whereas there also a few fancy ones for $300. 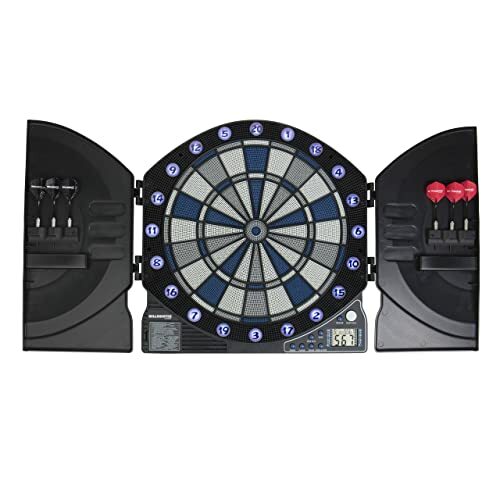 Select the electronic dart board according to your needs; if you are an amateur player your requirements might be different from a professional player. All of the above-mentioned dartboards are high-quality products. This article will help you find the best electronic dartboard with an affordable price and better performance than regular ones.